In an effort to finalize the portrayal of Hezbollah as a benevolent band of misunderstood peasant warriors, and to foster acceptance of other cultures such as Islam, the BBC retooled its cutest Teletubby character named Laa-laa into Hezbo-Laa-Laa. Sporting a characteristic martyr bandana with the motto "From cradle to grave" written in Arabic, and a suicide belt filled nails and rat poison, this cute and cuddly Terrortubby is intended to show European and American kids that beyond its desire to exterminate the Jew, Hezbollah is, in fact, a caring playmate that will tend to your social needs through a strong presence in the big, generous government! "Westerners need to look beyond 'the Jew' problem and learn from the early age that someone with so much faith in a one-Party rule, coupled with extensive social services administered by a totalitarian government can't be all bad," declares the BBC Director of children's programming Dan Foster. "Hezbollah is much like any other decent national-socialist government and we really shouldn't let small issue like Jews get in the way of social progress." BBC is already filming new episodes in which fuzzy little Hezbo-Laa-Laa will perform such tasks as "boarding a Tel Aviv bus," "entering a crowded pizzeria" and sing his favorite song Rocket Man. Let's hear Jewbaka's Tarzan yell. The purple one on the left is a grim reminder of what can happen in a botched back alley abortion. Look at the coat hanger stuck in her (?) head. Thank goodness for Roe vs. Wade. Let that be a lesson to you children; if it wasn't for legal abortions, you'd all be walking around with a coat hanger coming out of your cranium. You'd still be dead, but at least you wouldn't look silly. You'd still be dead, but at least you wouldn't look silly. And appearances are all that matter nowadays. Especially how you appear to the party...most important...ask Joe Lieberman. On the subject of appearances, Joe Lieberman (emphasis on the Lie), just to mention his name alone is clear violation of party doctrine now. I mean really, its alllll about the Lamont now, everyone is doing the Lamont. You are not cool unless you are doing the Lamont and I am happy to see all party faithful jumping on the bandwagon now with the Lamont. He has *great* hair, not to mention he has ca$h, which always make Her Excellency H.C (she dropped the Rodham for political reasons) very very very happy. As Socialist Reality Truth Creator, 2nd Class, Pyongyang, it saddens me to admit that the like minds of the BBC have created an approved and, with typically British juche, original homegrown program my Communist fellows here cannot even think of conceiving. Though we in Pyongyang have been host to many distinguished Palestinian freedom fighters, we did not use their knowledge; though we have even selflessly forcibly hosted for decades many Japanese (acknowledged experts, though running dog warmongering racist imperialists, in children's programming), we did not coerce their knoweldge, effectively. In short, we who are nourished on the Correct Thought of Marx, Engels, Lenin, and Kim Il-Sung could not have made Hezbo Laa Laa, whereas BBC non-Revolutionary bourgeiousie have. We are deeply troubled that an outwardly capitalist country like Britain can produce such Revolutionary works that help spread understanding of the Revolution in cultural guises outside the heretofore prevailing dominant European, that reach out to those capitalism hasn't yet begun to exploit directly. Comrades, what is the secret? If you don't reveal it soon, certain intimations have been made concerning my acquiring ample time for reflection on the creative process in Bokpaedook Reeducation and Medical Research Facility. Tests are underway for creativity enhancement drugs, and I would be a prime candidate to volunteer, I have been told, if my creativity doesn't begin cracking like Khushchev's shoe at the UN! Before Hezbo-Laa-Laa there also was a Tali-Tubby. This one has legitimate grievances against the rest of the world because of a coat hanger implanted in his/her/its head at the time of a botched back alley abortion. As Laika has pointed out earlier - "Thank goodness for Roe vs. Wade!" I love the Hezbo-laa-laa-polooza sing-a-longs they have on that show. It's really cute. 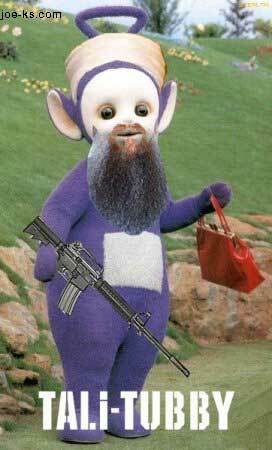 What is that Tali-Tubby doing with an imperialist assault rifle?!? He/She/It should be carrying the weapon of all true revolutionaries, the party-approved Kalashnikov AK-47. Markov Aureliovich congratulates you on your most excellent propoganda. With quality work like the above it will not be long until the real imperialists are in reeducation camps. When I saw this, I let out a bellow of Slavic laughter. It's not something you're likely to see in any bourgeois propaganda organ. Now we just need Jewbaka playing cowbell and life would be complete!